It happened for a reason,” says Brian Cortez of Highland, California. As he discusses the motorcycle accident, his voice is filled with gratitude, not regret. “If it hadn’t happened, my wife and I probably wouldn’t have gotten back together.” You can’t argue with that silver lining. I probably wouldn't be sitting here today. 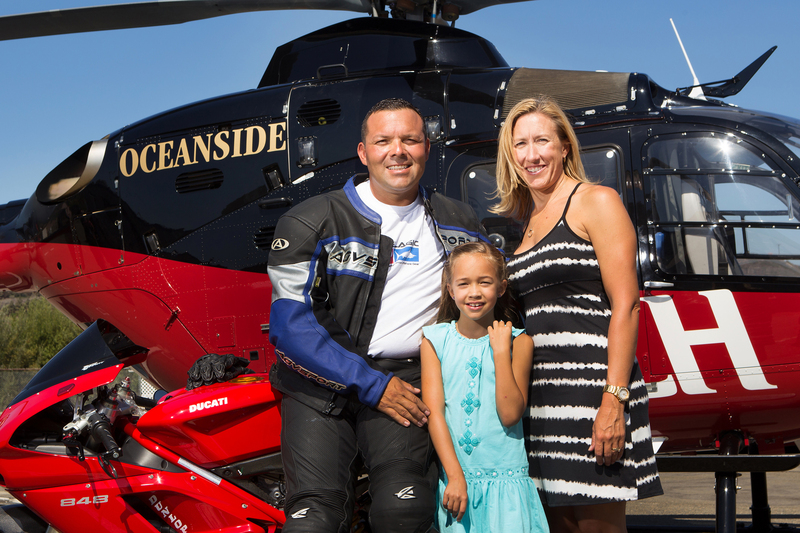 Brian Cortez in front of the REACH Oceanside helicopter that transported him to the hospital. Brian had been looking forward to putting on his race gear, getting on his 2011 Yamaha YZF-R1 and riding Palomar Mountain with three friends. Located in northern San Diego County, Palomar is very popular among motorcycle riders and sports car drivers for its challenging roads. Photographers station themselves at the abundant hairpin turns, hoping to sell their photos to the riders and drivers. “Yeah, we wanted to make sure they got some good pictures of us, knees dragging on the road and all,” says Brian, who has been riding since 2001. REACH 16 out of Oceanside had been called for the transport. The helicopter, piloted by Matt McLuckie, carried Flight Nurse Hilary Comeau and Flight Paramedic Jonathan Prucher. Jonathan was a ground ambulance paramedic in Los Angeles prior to joining REACH four years ago. 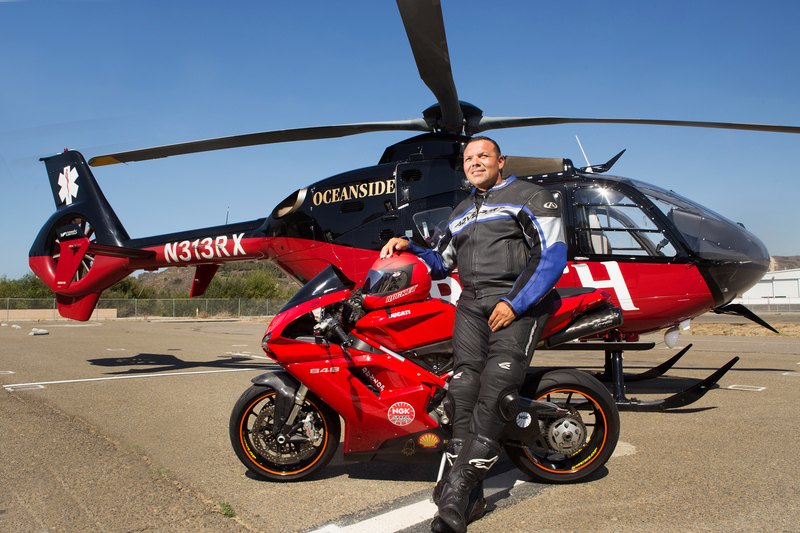 “The natural progression is to get into air ambulance,” he says. “It’s a larger scope of practice, and there’s more autonomy. You get to work with the most critical patients, which is extremely satisfying, and also challenging.” Jonathan reports that Brian’s transport went off without a hitch. 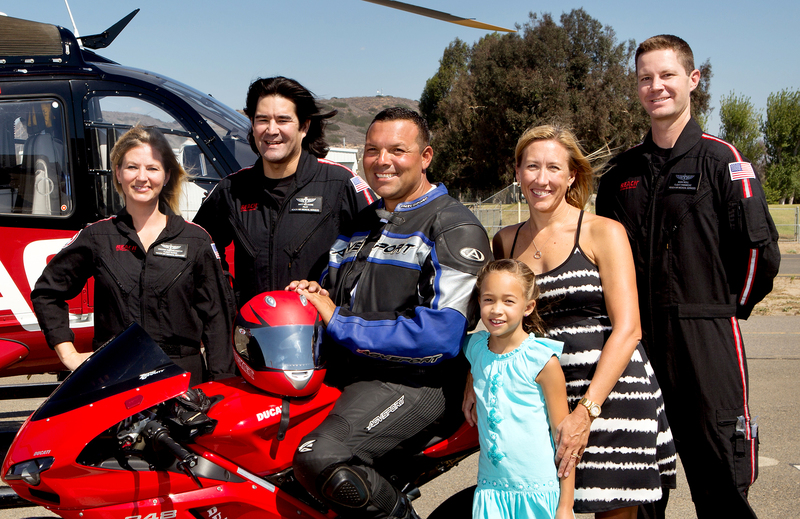 Brian Cortez, on motorcycle, is joined by (left to right) REACH Flight Nurse Brooke Inscore-Raster, Pilot Matt McLuckie, wife Amy, daughter Madison. and REACH Flight Paramedic Mark Neill. Brian Cortez is grateful to be back home with wife Amy and daughter Madison. REACH is grateful to have had the opportunity to be there for Brian, and we wish him and his family a bright and healthy future.